June 30, 2011  The U.S. team is ranked No. 1 in the world, and they won gold in the recent Olympics. But they're not the clear favorite to win World Cup — that would be Germany, which is both the defending champion and the host country. 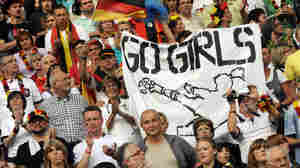 June 28, 2011  The U.S. women started off the FIFA Women's World Cup with a tight, tense game against North Korea Tuesday, playing in Dresden, Germany. Lauren Cheney shattered a 0-0 tie with a header that found the corner of the goal, nearly 10 minutes into the second half. May 27, 2011  The president of soccer's world governing body has been called to answer questions in a bribes-for-votes investigation. Both he and his challenger for FIFA's presidency must appear. The vote on who will be the next president is set for Wednesday. 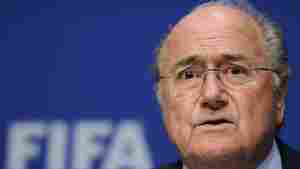 December 14, 2010  Sepp Blatter, head of the world soccer federation, went on to say that the game has "no boundaries." 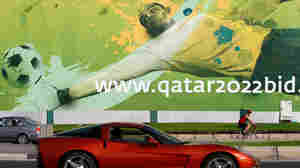 But gay rights groups say his comment about what homosexuals should not do in Qatar were offensive. July 1, 2010  Soccer fans groaned over a number of botched calls in this year's World Cup. Dave Zirin argues it's time to do more than complain. June 30, 2010  Robots playing soccer. June 14, 2010  How the papers are treating Robert Green. Vuvuzelas: Culturally Significant Or Downright Obnoxious? June 9, 2010  The vuvuzela -- to blow or not to blow (during the World Cup)? That is the question.